Text "MOM" to 27722 to donate or use UMC Advance Special #3021190. $10 buys a net to protect four people. Click here for information. LAKELAND -- Jesse Casanova knows the killer. A former Peace Corps volunteer who spent 13 months battling malaria on the front lines in Cameroon, Casanova has seen the effects of the disease up close. Impacting almost every aspect of life in many African nations, the devastation wrought by malaria spreads beyond widespread death in ways difficult for Westerners to grasp. "A lot of people don’t realize the true impact," said Casanova, who worked with several nonprofit groups fighting the disease. Sarah Legare of Stomping Out Malaria talks to villagers in Linguere, Senegal, about the importance of sleeping with mosquito nets. Photo from Stomping Out Malaria. Click here for information. Casanova, who attends First UMC, Lakeland, said no one is immune from malaria. Today is World Malaria Day, and United Methodist churches are joining the campaign to rid Africa of the disease, opening their wallets and hearts to raise funds and awareness in the fight against malaria. Among them are pastors and youth and worship leaders in Florida's Gulf Central District, who plan a basketball game to raise money for Nothing But Nets. The nonprofit nets campaign, supported by The United Methodist Church, has sent more than 7 million mosquito-repelling bed nets to Africa. The idea for the fundraiser arose during a recent Bible study meeting, said Maggie Corrigan, the district’s business administrator. Rev. John Powers, district superintendent, also has signed up to play. The game is set for 6 p.m. Friday, April 26, at Largo High School, 410 Missouri Ave. North. A freewill offering of $10 is being requested. On the heels of World Malaria Day, NBC television affiliates plan to air “Killer in the Dark: An Extraordinary Effort to Combat Malaria,” beginning May 5. The documentary, produced by United Methodist Communications, covers the fight against the deadly but easily preventable disease. Click here to check local affiliates for broadcast times. “We are trying to raise awareness of malaria and make people aware of the devastating effect it has,” said Rev. Gary Henderson, executive director for the UMC Global Health Initiative. From left, Gregory Thome, U.S. deputy chief of mission in Cameroon; Jesse Casanova, Lakeland volunteer; and Mirabell Kumfa, communications coordinator for Malaria No More in Cameroon, celebrate 50 years of Peace Corps presence in the West African country. Photo from Jesse Casanova. 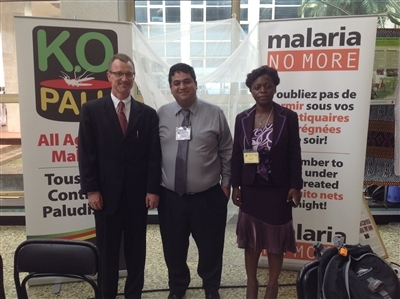 The group oversees Imagine No Malaria, The UMC’s campaign to drastically reduce malaria-related deaths in Africa by 2015. Imagine No Malaria, which also works with the United Nations Foundation and the Bill and Melinda Gates Foundation, has raised more than $30 million to combat the disease, training more than 5,800 community health workers and distributing mosquito nets throughout Africa. As a result of those efforts and others, the fatality rate for malaria has dropped by almost 50 percent since 2006. “A child shouldn’t have to die from a mosquito bite,” said Bishop Thomas J. Bickerton of Imagine No Malaria. 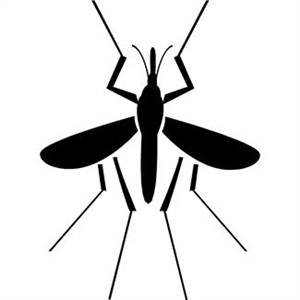 Coordinating the work of more than 200 volunteers, Casanova worked the trenches in the battle as the startup manager for Malaria No More and the Peace Corps’ Stomping Out Malaria In Africa effort. As a member of the U.S. Interagency Health Team at the U.S. Embassy in Cameroon, he worked with West African nonprofits and local government and traveled to towns and villages where the cost of malaria was driven home. “We're exceptionally proud of the work that volunteers like Jesse are doing across Africa,” said Matt McLaughlin, program manager for Stomping Out Malaria in Africa, which also publishes blogs from volunteers who work daily to eradicate the disease. • Malaria is a life-threatening disease caused by parasites that are transmitted to people through the bites of infected mosquitoes. • In 2010, malaria caused an estimated 660 000 deaths, mostly among African children. • Malaria is preventable and curable, and better prevention and control measures are dramatically reducing its toll in many places. • Non-immune travelers from malaria-free areas are vulnerable to the disease when they get infected. While he’s clearly passionate about helping others, Casanova also understands his subject very well, Rev. Cory Britt said. “Jesse is very thoughtful about what he does,” said Britt, associate pastor at First UMC, Lakeland, which donates a portion of its annual budget to Nothing But Nets. Casanova first entered the Peace Corps in 2006 after graduating from Lakeland’s Southeastern University with a marketing degree. He served two years in Togo. “I wanted to be able to give back, and at that time I was relatively unattached so I figured this was the best time to do it,” said Casanova, 30. Earning a degree in international human rights law after leaving Togo, he signed up again in 2012 with Peace Corp Response, a program that provides qualified professionals the opportunity to serve in rewarding, short-term assignments. He was placed in Cameroon, where he not only helped fight malaria but picked up an appreciation for things most Americans take for granted. “It definitely makes you appreciate the conveniences we have here,” Casanova said. -- Kevin Brady is a freelance writer based in the Tampa area.